As any artist will know it can be difficult to focus when your mind is all over the place. Lately, my mind has been flitting from one thing to another meaning any sustained period of work has seemed near impossible! However, I’ve had a couple of short sessions over the past week where I felt really engrossed in my work and felt I channelled a lot of emotion. I feel like art isn’t just a subject for some people, it’s so much more. To me, it’s not just something I’m ‘good at’, it’s an outlet, a distraction, part of my identity. Art is such a huge part of who I am I feel like it’s actually part of me, which is actually really quite reassuring when you’re battling with identity and trying to establish your place in this busy world. I’ve started my distance learning with the London Art College and so far I’m finding it interesting. Initially I was wary of the way Unit 1 had me going right back to very basics but I feel like I still took something away from it. Unit 2 was interesting as it covered perspective, which is something I haven’t particularly found myself delving in to much over the 15 years I’ve been studying art. It was generally assumed that perspective was just a matter of getting the proportions and distance of what you were looking at right. Unit 2 took a more…’geometry-based’ approach (if that’s the right term to describe it) which actually had me searching the library to find out more. 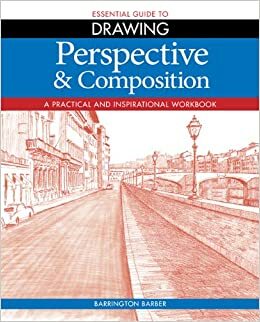 Next week I’ll be reviewing the book ‘Perspective & Composition’ by Barrington Barber. Perspective isn’t something you generally always have to worry about in the world of Illustration and I’ve found many inspiring pieces that appeal to the eye that aren’t in perfect perspective. It got me thinking of my own work though and how I’ve dealt with perspective without using the system described in Unit 2. Generally, I rely greatly on my own perception and trust what my eyes are seeing. I remember being just 8 years old and a teacher saying to me: we often draw what we think we should see, not what we actually see. I’ve remembered this ever since and always make a point of saying this to myself when I’m drawing from life. Below is an example of how I’ve used perspective relying on this concept. At the moment I’m working on a still life piece that focuses on using shading to create depth. The advice given was to focus on the display as a whole. This is a real challenge for someone like me who often gets bogged down in the details! But I’ll be posting the finished piece soon. It feels good to be working in pencil again and taking time out from life to be creative.